The sun emitted a mid-level solar flare, peaking at 8:29 pm EDT on April 17, 2016. NASA’s Solar Dynamics Observatory, which watches the sun constantly, captured an image of the event. Solar flares are powerful bursts of radiation. Harmful radiation from a flare cannot pass through Earth’s atmosphere to physically affect humans on the ground, however — when intense enough — they can disturb the atmosphere in the layer where GPS and communications signals travel. NOAA’s Space Weather Prediction Center states that “moderate radio blackouts were observed” during the peak of the flare. Such radio blackouts are only ongoing during the course of a flare, and so they have since subsided. NOAA’s Space Weather Prediction Center is the U.S. government’s official source for space weather forecasts, watches, warnings and alerts. This flare is classified as an M6.7 class flare. M-class flares are a tenth the size of the most intense flares, the X-class flares. The number provides more information about its strength. An M2 is twice as intense as an M1, an M3 is three times as intense, etc. This flare came from an area of complex magnetic activity on the sun – known as an active region, and in this case labeled Active Region 2529 – which has sported a large dark spot, called a sunspot, over the past several days. This sunspot has changed shape and size as it slowly made its way across the sun’s face over the past week and half. For much of that time, it was big enough to be visible from the ground without magnification and is currently large enough that almost five Earths could fit inside. 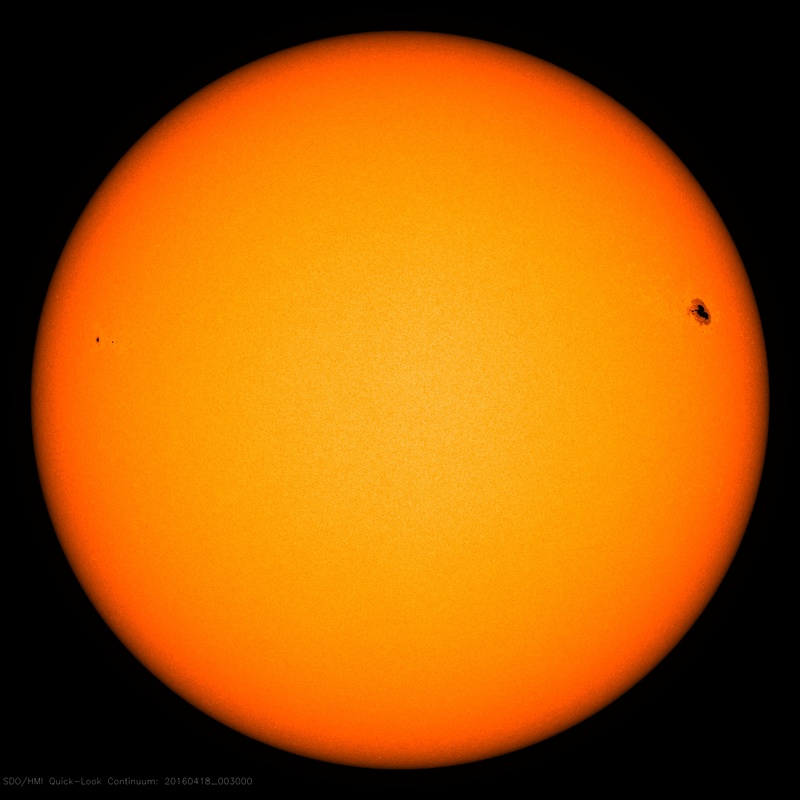 This sunspot will rotate out of our view over the right side of the sun by April 20, 2016. Scientists study such sunspots in order to better understand what causes them to sometimes erupt with solar flares. A black spot on the sun is visible in the upper right of this image captured by NASA’s Solar Dynamics Observatory. Such spots are evidence that this is an area of complex magnetic activity on the sun, which can sometimes lead to solar eruptions sending light and radiation out into space. This region produced a solar flare at 8:29 p.m. EDT on April 17, 2016. For answers to this and other space weather questions, please visit the Space weather Frequently Asked Questions page.